Have you ever thought of having a Hank-themed birthday party? Over the years, we've received countless emails from Hank readers (parents and kids alike) asking for ideas for how to throw a Hank the Cowdog party. And, here's our answer! And, please be sure to email us (using the "Get in Touch" option: http://www.hankthecowdog.com/author) or comment at the bottom with any additional ideas you've come up with on your own! 1) Food: So, Hank is pretty obsessed with eating, right? Juicy, fatty ends of bacon, steak, chicken dinners, or...well, just about anything that comes out of Sally May's kitchen. When throwing your Hank the Cowdog party, be sure to take a look at our recipes section on the site for menu ideas. (C) Combine some icing-outlines with a cake that is cut into the shape of either the classic Hank-profile picture (shown above) or Hank's security-badge picture (at the top of each page of the site). (4) Lastly, Have Fun and Be Creative! 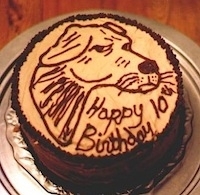 Check out some of these great ideas (Hank the Cowdog Birthday Party Ideas) that a Hank fan posted a few years back! Not only did she take the plunge and create a Hank cake shaped like Hank's head, she even made Emerald Pond Jello! (Now, that's creative!) Our favorite idea of hers? Pin-the-Tail on Pete the Barncat. Tee hee. Be sure to email or comment with your ideas and suggestions!